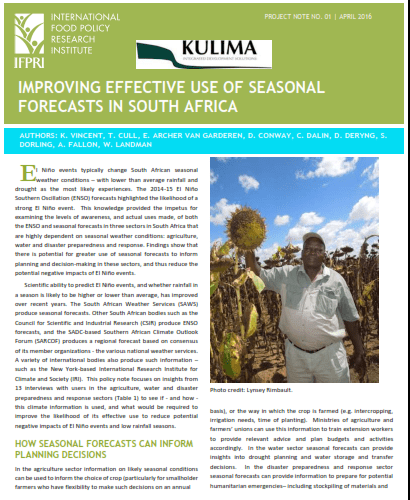 The International Food Policy Research Institute (IFPRI) and Kulima Integrated Development Solutions have released a project note on "Improving effective use of seasonal forecasts in South Africa". This is an output of the "Southern Africa Hydro-Economy and Water Security" project, funded by the Belmont Forum's International Opportunities Fund. Together with partners from the Grantham Research Institute on Climate Change and the Environment, the University of East Anglia's Water Security Research Centre, South Africa's Council for Scientific and Industrial Research, and UEA's Climatic Research Unit, the note outlines ways of improving effectiveness of seasonal forecasts based on primary research with stakeholders in the water, agriculture and disaster preparedness and response sectors in South Africa.